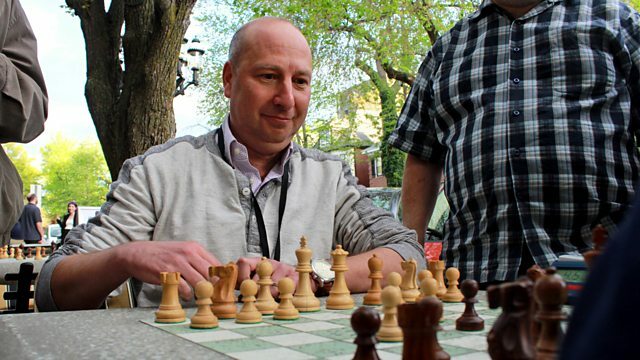 The story of how the mid-western city of St Louis in Missouri has become a world centre for the game of chess, with funding from a controversial millionaire. Dave Edmonds travels to the mid-western city of St Louis (location for the musical 'Meet Me In St Louis', starring Judy Garland) for the US chess championships. The city has become a world centre for the game of chess. Its status has partly been achieved by funding from a controversial multi-millionaire, whose childhood included time in an orphanage. Rex Sinquefield is well known for his fascination with the game and his enthusiasm is shared by many others. There is a thriving chess centre, elite tournaments which attract some of the top players, a Chess Hall of Fame and chess lessons in local schools. St Louis is one of America's most violent cities and has most recently been in the news for race riots which erupted when an unarmed black man was shot by police. Can the game of chess serve to lessen racial tension and unite its citizens across the board?